A set of links with some brief notes and images, of interesting tech things unearthed since 4th November. With stuff from: Citrix, Huawei, Microsoft, Netapp, StarWind, and VMware! If Citrix is your thing, I’d highly recommend running through Citrix KC Top 10 October list! “ShareFile with StorageZones gives IT the flexibility to choose between customer-managed StorageZones allowing IT to leverage on-premises storage within their private cloud or Citrix-managed secure cloud storage options in multiple worldwide locations.” Think Dropbox for Enterprise with on-premise! A very useful set of recommended antivirus exclusions for Citrix Provisioning Server! Don’t like Windows 8’s missing start button – try Classic Shell! 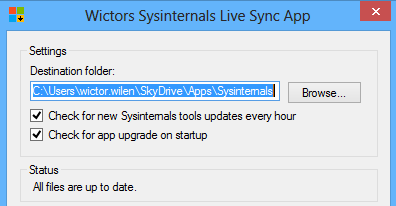 Ever wanted to keep the sysinternals packages on a server up to date - now you can! More flexible than the built-in MMC Remote Desktops snap-in! “Download the datasheets, white papers and technical presentations that will help you evaluate Microsoft SQL Server 2012” – a hefty 129.8MB of information! - A FAS3220, an uprated 3210, with up to 480 drives, 1.44PB capacity, and 1TB of flash cache; its drive count and flash cache amount have both doubled. Use NetApp SnapDrive to migrate Exchange 2010 from EqualLogic to NetApp, and then SnapManager for Exchange (SME) to back it up. What’s new in the VMware IO Analyzer 1.5?